Middle Georgia State University is now offering Online Advising. Through Online Advising you can meet with your advisor online from anywhere in the world! 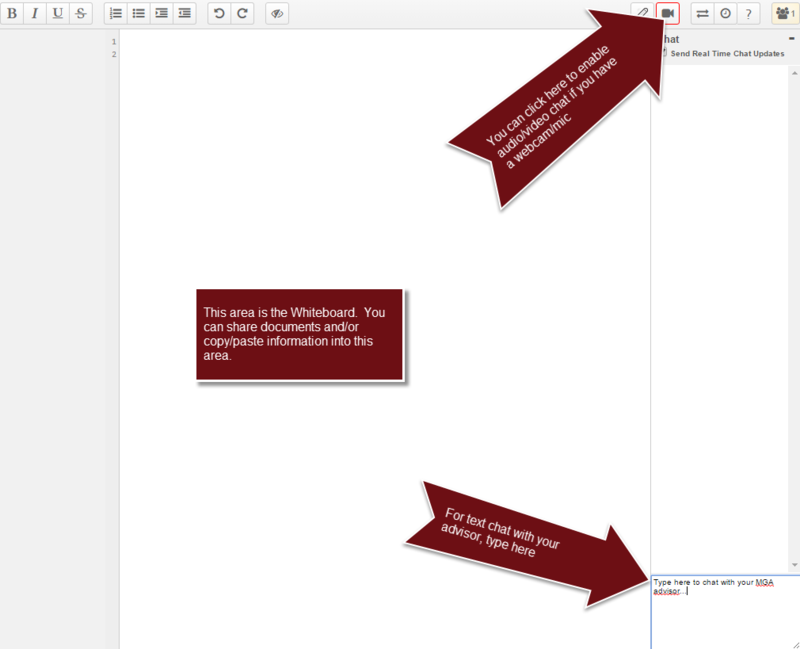 Use text, audio, and video chat and an online whiteboard to work with your advisor without having to visit campus. Online Advising is perfect for adult students, Dual Enrollment students, veterans and military students, and others who cannot easily make it to an on-campus advising session – but online Advising is available for all MGA students, regardless of status or program. Click on the “Schedule an Appointment” button and follow the instructions below to set up an online appointment with your advisor. Watch our video or read step-by-step instructions below. Click on the “Schedule an Online Advising” link, above. If you are a first-time user, select “Click here to register” and follow the instructions on the following screen to set up your account. If you are not a first time user, simply log in using your WCOnline account information. 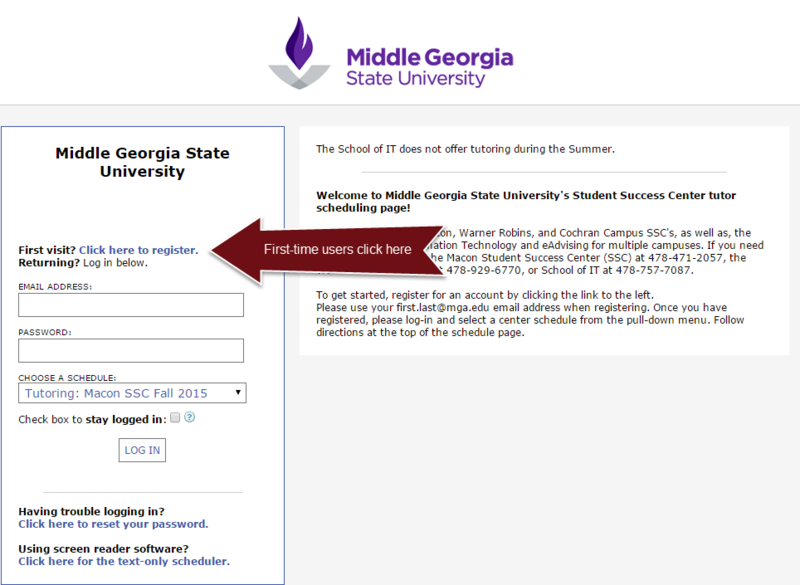 Select E- Advising (name of major or campus) from the schedule dropdown box. Select your desired date/time that is available from the appropriate advisor's schedule. Available times/dates will be shown in white. Unavailable times/dates will be shown in other colors. 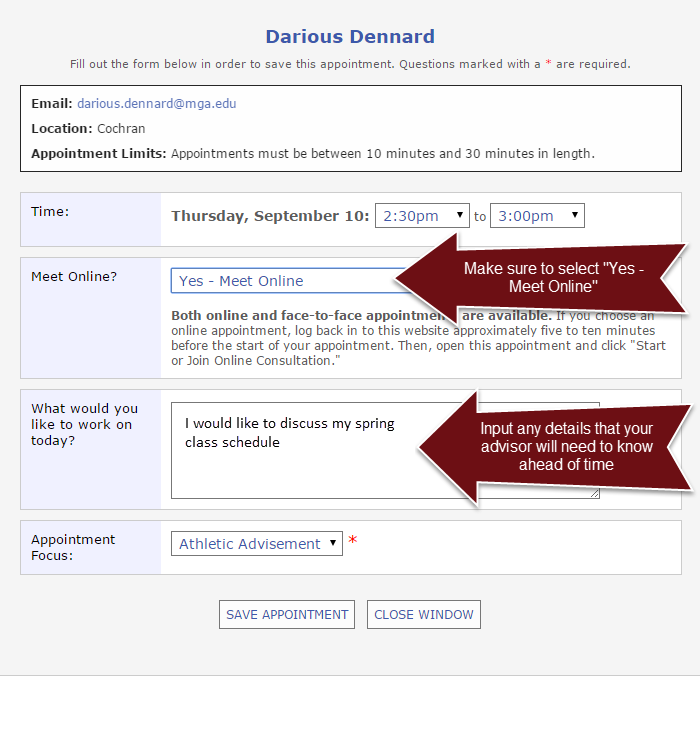 After selecting an available time slot, simply click the slot and enter in the information for the advisor. You will need to select if you want to meet face to face or online. You may also note what information you would like to discuss during the advising session by typing a note to your advisor. A file/document may also be attached to the advising session by selecting the “attach a file” option within the Admin Options section. Click on “Save Appointment” to set the appointment; once the appointment has been saved, you will receive a confirmation email. Check your email for your confirmation. 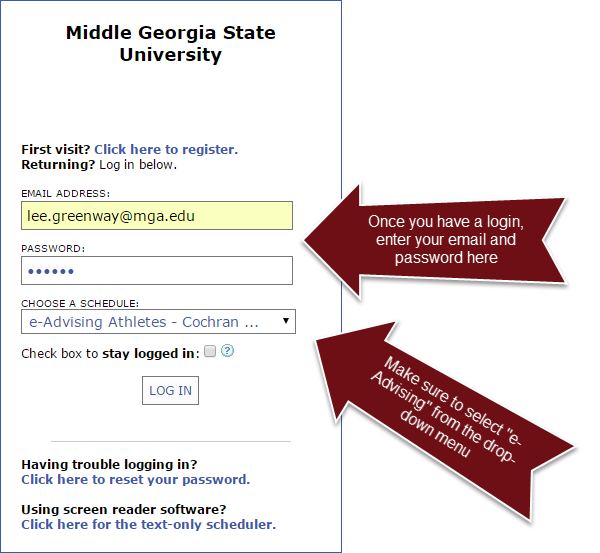 On the day of your advising appointment, go to https://mga.mywconline.com and log in using your WCOnline login information. Click on the time/date of your appointment. 10. 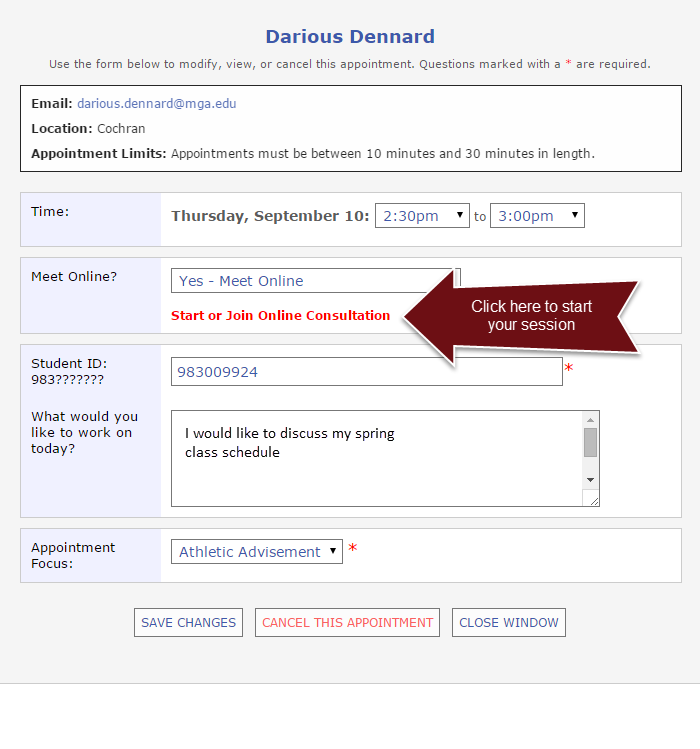 In the new window, in the section “meet online”, select “Start or Join Online Consultation,” this will start the advising session. a. Documents that were uploaded can now be downloaded by the advisor or student and seen in the session. b. Live Chat is available; you can chat with your advisor during your session. c. If you have a webcam and/or microphone on your computer, there are options to enable audio/video chat during your session.